Alfonso Cuaron's Netflix epic Roma could become the first ever winner of both best picture and best foreign language film at the Oscars. Its success could change how the category is perceived - and shine a light on the four other worthy nominees. In the last decade, there have been changes almost annually to how the Oscars arrive at their shortlist for best foreign language film. The category has existed since 1947 and the number of films involved grows almost every year. There were 87 this year, and no-one could view them all. So in recent years, volunteers would split into three groups to judge a portion each. But this year there are new bosses and they've changed the system yet again. To boost inclusivity, it was hoped more members would vote, although most will see fewer films each. 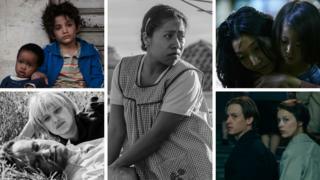 For now, the unique fact about the 91st Academy Awards is that the hot tip for winner as foreign language film could well clean up in other categories too - Alfonso Cuaron's Roma has 10 nominations in all. Strictly speaking, the Academy Award goes to the winning nation. But since 2015 the director's name has appeared on the Oscar statuette too. Life among the poorest of the poor in Beirut. Zain is a sparky 12-year-old who's angry at his poor Syrian parents for making his sister go off with a man she dislikes. He runs away and strikes up a friendship with Rahil, a cleaner from Ethiopia who lives in a shack with her young child. This central story plays as an extended flashback as Zain takes his parents to court, suing them for giving him life. There are strong elements - especially the performances of Zain al Rafeea and Yordanos Shiferaw as Zain and Rahil. Neither is a professional actor. The film gives a convincing picture of life for the poorest immigrants in Lebanon - particularly for women and children. The circumstances Zain grows up in will strike a chord elsewhere. But the framing device feels clumsy and improbable: it undermines a film which otherwise has the power to move. Poland's track record: 10 previous nominations. The sole winner was the same director's Ida four years ago. The film, shot in black and white, covers some 15 years of Polish history from the late 1940s. Wiktor and the young singer Zula meet and fall profoundly in love - but will they ever get their lives in sync? Wiktor leaves Poland amid the complexities of 1950s politics and the story follows him to Paris. Modern writers and directors aren't great at constructing grown-up love stories. Pawlikowski, whose career has mainly been in the UK, has shot and co-written a story in which the audience senses that two attractive people were made for one another and wants them to get together. The film also reveals a lot about post-war Poland, creating other convincing characters along the way. It looks beautiful and it's the film with the best chance of pushing Roma out of the way. Germany's track record: 19 nominations (including one for East Germany) including three wins. An epic based in part on the real-life German artist Gerhard Richter, who was born in 1932. Kurt (played by Tom Schilling) is born in Dresden in the Nazi era and becomes an artist in post-war East Germany. He falls in love with Elizabeth, whose father, a hospital administrator, is a former Nazi who conspired in the death of Kurt's aunt. The film (more than three hours long) moves to West Germany for the 1960s. The director took the foreign language Oscar in 2006 for The Lives of Others, which was set in the German Democratic Republic and which many critics loved. It became a big international hit. But Never Look Away has met less acclaim on US release, with many reviewers considering the running-time excessive. Some praised the film's look and ambition but others found it meandering. Damaging publicity came when Gerhard Richter was sharply disapproving of how the film uses parts of his life. Mexico's track record: Eight previous nominations - no wins. Cleo is the live-in maid for a prosperous couple in Mexico. She is of indigenous descent. (Colonia Roma is a middle-class district of Mexico City.) The marriage of Sofia and Antonio is clearly under strain and eventually he leaves, although the children are told he's gone away to work. The children at times seem spoiled but are genuinely fond of Cleo. She becomes pregnant and we come to understand her better and see some of the tensions in Mexican society. Many view Roma as the inevitable winner in this category. It's a superb bit of film-making and combines narrative drive with a poetic sensibility that doesn't ignore real-life tensions in the Mexico of the early 1970s. Like Cold War, it's shot in black and white. If it becomes the first winner in this category also to take best picture, it will be a big moment in Oscar history. Or will Academy voters decide that to reward Roma as foreign film would be overkill, depriving other film-makers of the boost an Oscar brings? Another insight into the harsh realities of poverty. Osamu and Nobuyo are a couple barely getting by financially in a house in blue-collar Tokyo. They're living with an old woman who enjoys their company. They bring a young girl into the home who they think may be a victim of abuse. In some ways the household is a loving one but the group survives only by shoplifting - a skill in which they've become expert. Eventually their survival tactic is uncovered. The film offers a view of Japan unfamiliar to outsiders. The screenplay doesn't portray the family as caricature loveable rogues but we do come to understand the pressures they face. Both the adults and the children are well played and we care about what happens to them. It's notable that, as with Roma and Capernaum, fault-lines of class, income and ethnicity shape the narrative. But with two strong frontrunners, it's not likely Japan will take the Oscar this year. The Oscars will take place on Sunday, 24 February.